The Vizsla (pronounced ‘veezhla’, ‘zh’ as in ‘vision’), also known as the ‘Hungarian Vizsla’, ‘Hungarian Pointer’, or ‘Magyar Vizsla’, is an ancient Hungarian breed. It was used by the Magyar tribe of the Carpathian Basin for rat hunting as far back as 800 A.D, and later adapted for pointing, retrieving, and tracking. The first written record of the Vizsla appears in the ‘Illustrated Vienna’ chronicle, prepared on order of King Louis the Great in 1357. Vizslas faced near extinction in the 1800’s, falling in popularity to the English pointer. The Vizsla is an ancestor of the Weimaraner and German Shorthaired Pointer, and these breeds may have been later crossed back into the Vizsla. The rare Wirehaired Vizsla (only a few hundred exist in North America) was developed by crossing the Vizsla with the German Wirehaired Pointer and Griffon in the 1930’s for a dog with heavier coat for hunting in cold weather. A Vizsla named Sari was the first Vizsla imported to the United States, in 1950. 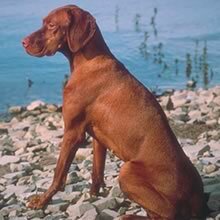 The Vizsla was recognized by the American Kennel Club in 1960 and is today a popular show dog, hunter, and pet. The smooth haired Vizsla has a shoulder height of 52-61 cm (20-24 in). The wirehaired Vizsla is slightly taller at 54-62 cm (21-24 in). Vizslas weigh 18-29 kg (40-65 lbs). They have long, low set ears, eye color fitting with the coat color, white teeth, and moderate stop (depression where the muzzle meets the forehead). The Vizsla has a tail which is usually docked at two thirds the natural length (three quarters in wirehaired) and small, round ‘cat feet’. It is a medium sized, muscular, lean dog. The Vizsla varies from golden rust to dark gold to red. Small white markings on the chest and feet are permissible. The smooth haired Vizsla has a short, abundant coat. The rare wirehaired Vizsla has a close, dense, wiry, coat 2-3 cm (.75-1.25 in) in length, with a water-repellant undercoat. The Vizsla is affectionate and intelligent. It is known for its loyalty. Vizslas are very energetic and will become destructive if ignored or not sufficiently exercised. The Vizsla is affectionate and intelligent. It is known for its loyalty. Vizslas are very energetic and will become destructive if ignored or not sufficiently exercised. The Vizsla is very gentle and gets along well with children, other dogs, and any household pets. It will bark at strangers. You can find Vizsla puppies priced from $400 USD to $2200 USD with one of our credible breeders. Browse through our breeder's listings and find your perfect puppy at the perfect price. The Vizsla is very gentle and gets along well with children, other dogs, and any household pets. It will bark at strangers. The smooth haired Vizsla requires very little grooming; it should be brushed periodically to remove dead hairs and bathed a few times a year. The wirehaired Vizsla must be plucked periodically. The Vizsla has a life expectancy of 10-14 years. Though not unhealthy, the limited number of Vizsla available for breeding leads to a few potential health problems, such as epilepsy, hip dysplasia (malformed hip joint which can cause lameness or arthritis), digestive problems (including possible food allergies), and eyelid problems such as ectropion and entropion. The smooth haired Vizsla is not tolerant of cold and should not live outdoors. The Vizsla is not difficult to train because it is happy to learn and eager to please, though it can be stubborn. Consistency is important. Vizslas are sensitive and should be trained gently; harsh training methods are likely to backfire. The Vizsla is an energetic breed which requires a substantial amount of exercise, including playtime in a large yard, long walks or jogs, and most especially hunting. Most Vizslas enjoy retrieving and love playing in water. Vizsla Puppies for Sale - Shipped Worldwide! Finding the right Vizsla puppy can be dog gone hard work. PuppyFind® provides a convenient and efficient means of selecting and purchasing the perfect Vizsla puppy (or Vizsla puppies) from the comfort of your home, 24 hours a day, 7 days a week. Take advantage of our PuppySearch or leisurely browse our directory of hundreds of dog breeds, Vizsla dog breeders, Vizsla dogs for adoption, and Vizsla puppy for sale listings with photos and detailed descriptions. Some Vizsla puppies for sale may be shipped Worldwide and include crate and veterinarian checkup. Many Vizsla dog breeders with puppies for sale also offer a health guarantee. With thousands of Vizsla puppies for sale and hundreds of Vizsla dog breeders, you're sure to find the perfect Vizsla puppy.